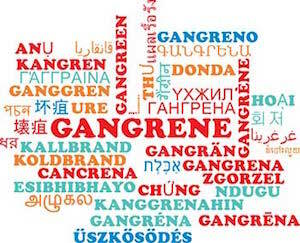 If Bed Sores are not Timely Treated, can Gangrene Develop? Yes, gangrene can develop if you don't treat bedsores quickly. Gangrene and other infections are the greatest risk from bedsores. Hospital and nursing home staff must take steps to prevent bedsores, be alert to the signs of such sores, and respond quickly if pressure sores develop. Known medically as decubitus ulcers, bedsores or pressure sores develop when constant pressure is applied to an area of the body. This pressure restricts the blood flow, which, if not remedied, can lead to the skin and tissue in the affected area dying off. Bedsores fall into four different categories of severity. Stage I. There is no breaking of the skin, but it has turned red. Later, if no steps are taken, it may turn purple. It may also be warm and hard to the touch. Some swelling may occur. Stage II. The skin may break into an abrasion. Alternately, a blister may develop. Some of the skin on the surface has begun to die. Infection becomes a risk in the second stage. Stage III. The skin has worn away to reveal tissue underneath. A crater of a wound has appeared and the exposed tissue is damaged. The risk of infection is severe. Stage IV. The tissue has now worn away, revealing the muscle or the bone underneath. The chance of infection is extremely high and the patient's life is in danger. Gangrene is the death of tissues due to insufficient blood supply or infection. Bacteria grow in the affected area and produce toxins which kill the tissue. The infection, if left untreated, will spread as the area of dead tissue widens. Sepsis can occur. Sepsis is when an infection gets into the blood stream and is carried throughout the body. Sepsis can be difficult to treat and even deadly. Where are Bedsores Likely to Occur? Whenever a patient is bedridden or bound to a wheelchair, they are at risk for experiencing the type of pressure that can restrict blood flow and cause a bedsore. Normal, healthy individuals turn in their bed or get up from a chair and walk around. Even if they don't get up or turn they can at least shift their weight. Once a bedsore develops, it is critical that hospital or nursing care staff take the necessary steps to help the body heal before gangrene sets in. In less severe bed sores a little debridement of the affected tissue, coupled with pressure relieving techniques and devices, may be enough to arrest the problem and allow the body to heal. Debridement is the chemical or surgical removal of non-viable tissue. If a crater has developed, debridement may need to be coupled with a wound vac, which drains the area of fluids and aids in the healing of the pressure sore. The most severe cases of bedsores may require flap reconstruction surgery, in which healthy skin from other parts of the body is used to close up a hole once it has been debrided and disinfected. As a last resort, amputation may be required. The first line of defense against pressure sores is to assist the patient in relieving pressure with frequent turns and pressure relieving devices if necessary. Staff should always be on the lookout for signs of bedsores, even if they are taking thorough precautions. In the event that a bedsore occurs, immediate steps are necessary so that gangrene does not develop.